Funcom's snapping the pieces together on the latest Lego MMO attempt. Funcom has announced that registration is now open for the closed beta of Lego Minifigures Online, which can be done at this website. Funcom has stated that an open beta will occur before the full game's scheduled launch in the second half of 2014 on PC, iOS and Android. Lego Minifigures Online was announced in late August and is the second attempt to make an MMO from the Lego brand, following the lackluster success of Lego Universe. 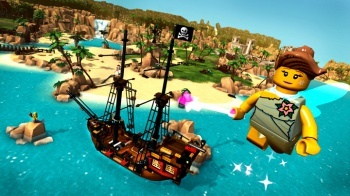 The new game lets players take control of one of several of the Minifigures and adventure across Lego landscapes such as Pirate World, Space World and Medieval World. Lego Minifigures Online also takes several cues from recent games such as Skylanders and Disney Infinity in that you can unlock additional characters by buying more Minifigures. Just hope they don't include the yodeling Bavarian Pretzel Girl. Yodels are totally OP.